Description: Model AM-49-1500 is a 2450 ohm to 50 ohm (49:1) broadband multi-core impedance transformer (unun) housed in a NEMA enclosure box (4″ x 4″ x 2″) with top halyard hoist/antenna feed point and a side stud used for a counterpoise connection. 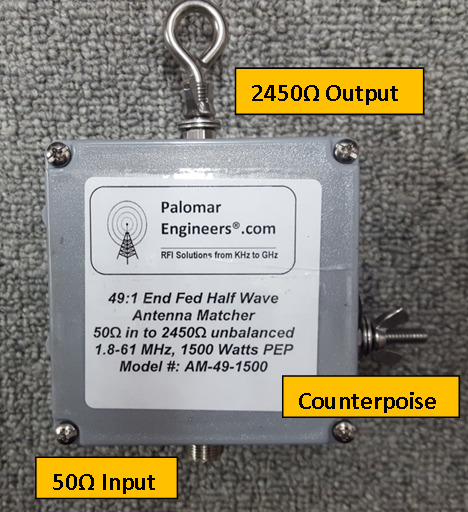 This antenna matcher is typically used with end fed half wave antennas with feed point ranges from 2000-3000 ohms at RF power levels up to 1500 watts PEP when used with a matched load. With a matched 2450 ohm load the SWR over the frequency range 1.8 to 31 MHz is typically less than 3:1 on the coax feed side. This antenna matcher has a broader frequency range, higher power level and flatter impedance response curve than its competitors. Multiple band half wave antennas can be connected to the output at the same time for better efficiency. Minimal counterpoise required in addition to the coax braid. Just add wire and go!